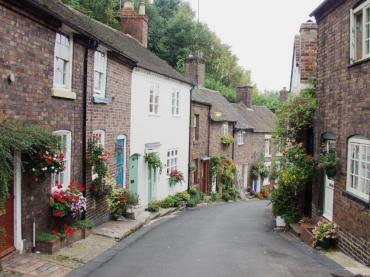 Bridgnorth is an ancient market town built on a red sandstone ridge which separates High Town from Low Town. The two are connected by winding streets, a short funicular railway and flights of steep steps. 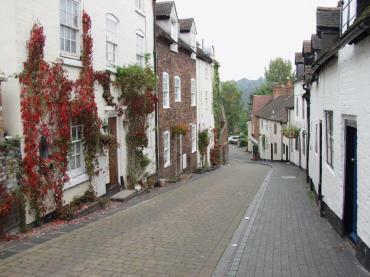 Railway street is one of the quaint winding narrow back streets in Bridgnorth which, needless to say, leads down from High Town to Low Town towards the railway station. The station is on the Severn Valley Steam Railway. 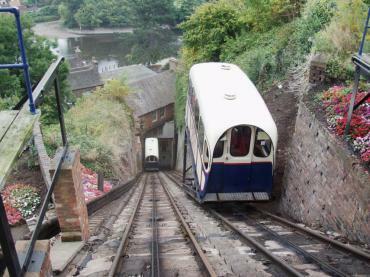 This short funicular railway connecting High Town and Low town was opened in 1892. It was originally worked using water. The tank on the car at the top was filled with water from a tank at the top station. When the car's tank was full, the weight of the car was then more than enough to compensate for the bottom car with its 18 passengers. As the top car was being filled, the tank on the bottom car was being emptied, and the water pumped directly up to the top station. The funicular is now powered by electricity. A train hauled by locomotive 42765 having just arrived at Bridgnorth Station on the Severn Valley Railway. The Severn Valley line was originally built between 1858 and 1862 from Hartlebury, near Droitwich, to Shrewsbury, a distance of 40 miles. Services now run every weekend and also daily at peak times. 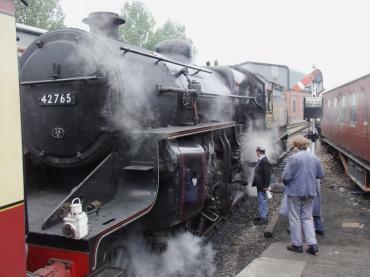 It is a full-size standard-gauge line running regular steam-hauled passenger trains between Kidderminster in Worcestershire and Bridgnorth in Shropshire over a total distance of 16 miles. The steep Cartway links high and low towns; a meandering street that was once the heart of an important inland port. Many of Cartway's houses were once inns and hostelries serving the river travellers. This road was once the only route for wheeled vehicles travelling between the two levels. 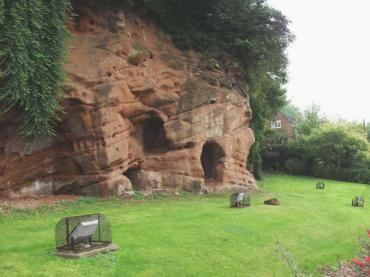 The caves in the sandstone cliffs bordering the road were used as family dwellings until the mid 19th century. This is part of the red sandstone ridge which separates High Town from Low Town showing some man-made caves. Geologically this rock is New Red Sandstone (Permian - about 290 million years old) and was probably laid down in desert conditions. The weathering has accentuated the cross-bedding.